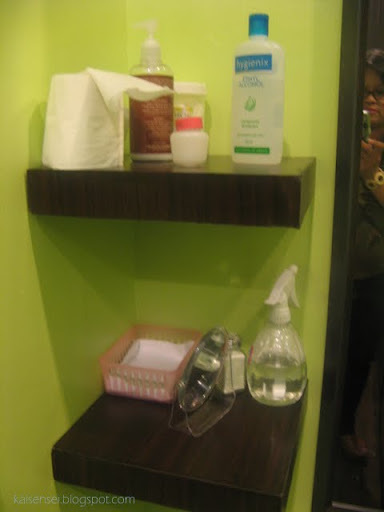 LAY BARE Waxing Salon has definitely made its name well known here in the Philippines as one of the first ever unwanted hair removal specialist in the Philippines. Lay Bare was made possible through these two amazing sisters Miss Fiona and Miss Monique. 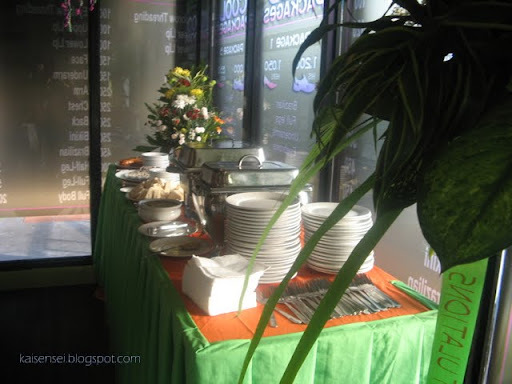 They came up with this brilliant idea of setting up exclusively waxing salons during a time when waxing or more specifically Brazilian waxing was not as well known mainstream. 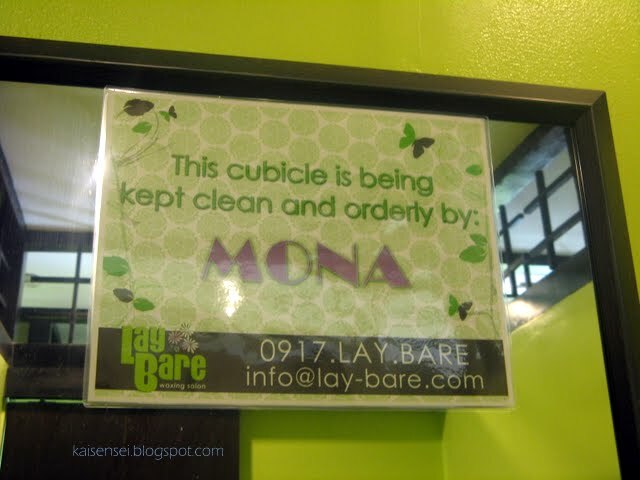 After five years in this business, Lay Bare has achieved its landmark of opening 40 branches nationwide. 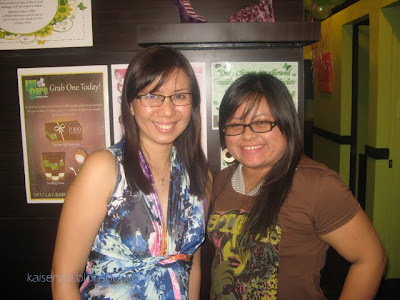 Last September, I was able to meet Miss Jamie from Lay Bare at the Blogapalooza event where she explained how Lay Bare works and how important it is for us to have a regular waxing. 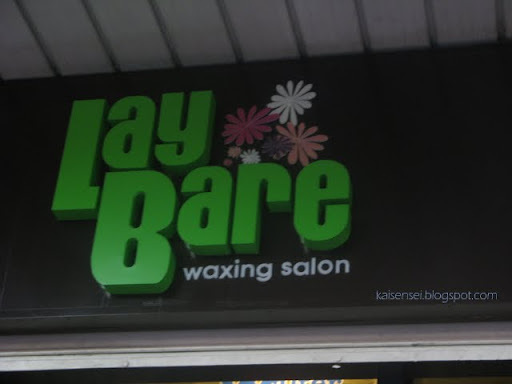 All of us who attended the event were also given gift packs from Lay Bare plus to be able to try out the waxing services offered by Lay Bare, we were each given a free Bikini wax treatment. Honestly, I've never tried waxing before! I am terrified of the thought of enduring the pain of hot wax treatment and the very painful procedure of removing the wax strips really wasn't my cup of tea. So I had no intention of trying it out. However, my sister-in-law, TIN of Ohhthat.blogspot.com, encouraged me to try it and swore it didn't hurt. She has been a Lay Bare customer for quite some time already and has highly recommended it to me several times already. 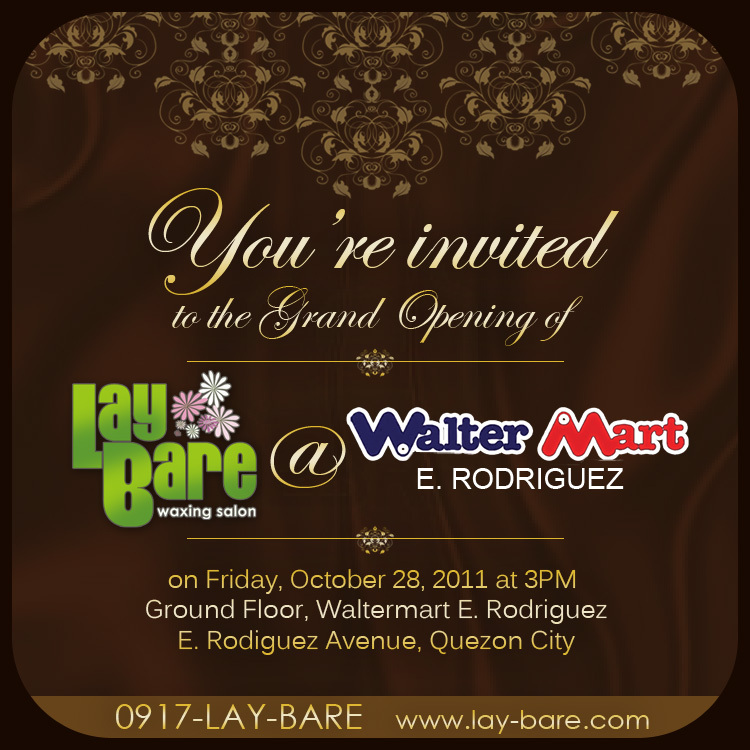 Then I finally decided to stop procrastinating and face my fears because I was invited by Miss Jamie to attend the Grand Opening of Lay Bare Waxing Salon at Walter Mart E. Rodriguez. 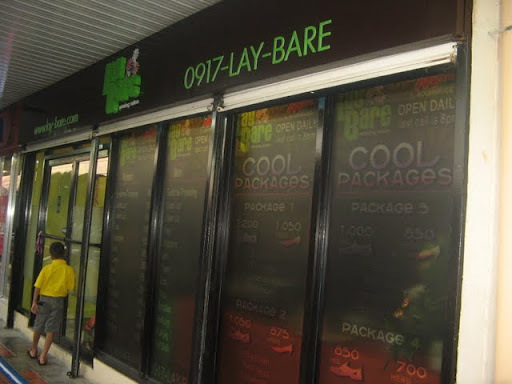 Lay Bare Waxing Salon at Walter Mart E. Rodriguez had its soft opening last September but officially had its grand opening last October 28. 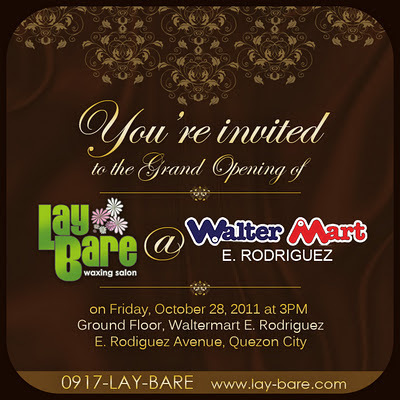 It was quite a memorable day since the Walter Mart E. Rod Lay Bare branch is the 40th branch to open. Ribbon cutting ceremony conducted by Miss Fiona's daughters. 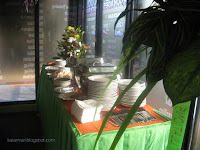 Immediately after arriving and the ribbon cutting, I was invited to try out their services. 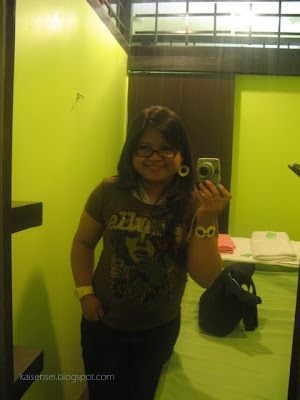 Well since I wasn't in much of a hurry to have my first waxing done (I was just steadying myself to face the "unknown." 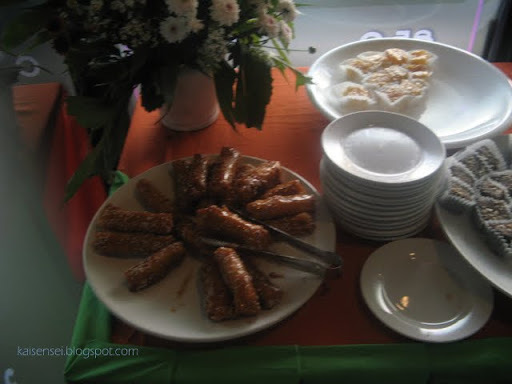 I know its kinda silly but hey, I went to this event without my "kakambal na blogger", Jen, along so I had to gather my courage. haha.. ), I decided to have some refreshments as well and in the process was able to have a good chat with one of the owners of Lay Bare, Miss Fiona Hilario. Throughout our conversation, I was able to get to learn more how the waxing salon business has evolved since the time she first started this business. Indeed it took a while before Filipinos (or Pinays rather) overcome their "shyness" and embraced this mode of removing unwanted hair. And after finding out that not only that it works, but in terms of trust level issue and the service given - many have found it exceptional and Lay Bare's popularity grew by word of mouth and recommendations. 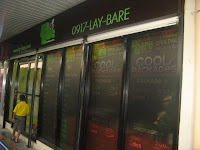 I for one cannot help be impressed how Lay Bare waxing salon was able become quite well known in its unique service thus making it a staple fixture in our well-known malls today. Miss Fiona was a real sport and encouraged me to try any of the waxing treatments when she found out that it was my first time to wax. 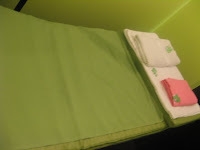 She mentioned that Lay Bare's most popular waxing treatment as to date is the Brazilian Wax Treatment. And yes, there are quite a number of men availing it too! I, on the other hand, had already made up my mind that I will take up Miss Fiona's offer to get a hair removal treatment - and that is the Half Leg Treatment that would cost around Php 300. Since it was my first time, I decided to play it safe. Also since I shave my lower legs anyway, I wanted to see how long it would be before my hair would grow back. So I finally chose a cubicle where I will be having the treatment. The cubicle that I chose was attended by Ate Mona. The cubicle was quite reassuring in its cleanliness and privacy. So how did I fare? Well I can now say that all my fears and apprehension about waxing in general was flushed down the drain! I DID NOT FEEL any PAIN at all! There was a slight stinging sensation as Ate Mona worked her way on my leg. But it was a tolerable type of sting and seeing her steady and assured hands convinced me that I should not worry a single bit. In fact, I felt a bit relaxed and found myself humming to the tunes being played on "Lay Bare" Radio. Cold wax treatment of Lay Bare is NOT painful at all! Oh and not only is it pain - less but it is quite effective if I might say so! Hair on my lower legs took some time before it started to grow again. This experience was really pleasant and I wouldn't mind coming back to Lay Bare again and have my legs waxed and maybe try other services as well. Just before I left, I was reminded of several things that I should and should not do before and after waxing. So here are some things that you should be prepared for when you have your waxing treatment at Lay Bare! 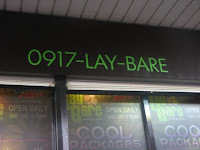 Don't forget to drop by www.Lay-Bare.com or text 0917-LAY-BARE for more info and updates on what's happening on Lay Bare. Thank you so much Lay Bare for the wonderful experience that you allowed me to have and also help me overcome my "fear" of waxing. So Coffeeholics, don't forget to drop by Lay Bare the next time you feel like being adventurous or maybe just wanna remove unwanted hair. :) Have any of you dears tried Lay Bare already? Do feel free to comment and share!